readings of electricity, heat, water and gas meters. detection of emergency situations (e.g. water leakage, meter damage). Starting from today, no electricity bill will be an unpleasant surprise. The buyer will be able to trace and influence the energy consumption on his/her own both by the use of a smartphone and tablet. When a meter is mounted in the building, its purpose is known and it must be mapped in the system by selecting a relevant label, e.g. the main heat meter. The system uses internal communications modules or 868 MHz radio signal converters, wireless MBus OMS. Customers that need advanced system functionalities, in particular remotely controlled telemetry, will be offered with SmartOMS or data exchange with external SCADA-type systems via dedicated API (separate valuation). The system converts collected data into defined file structures of consistent formats and delivers it to other systems, e.g. billing systems, at defined time intervals. It is possible to create various formats of reports and export the data based on individual customer requirements. In each facility form, the user may enable logical alerts, i.e. define mathematical formulas which compare values or results read with a user-defined limit of a time function (small growth of volume in a water meter during consecutive 3 hours may reflect leakage in the system and information about the detection of such a growth in water meter reading will be immediately sent to the consumer). The alerts allow for fast and precise identification of failures and defects in internal installations or places that must be adjusted. SmartGlobe will be an interface between the energy supplier and energy buyer. Cooperation between the parties is possible thanks to the tools that provide the readings. With the use of value labels, the manner the data are made available may be tailored precisely to the buyer’s needs on a case-by-case basis. Capital for the start-up of Globe Of Things was obtained under the Innovative Economy Operational Program, which is co-financed by the European Union and implemented by the Polish Agency for Enterprise Development. 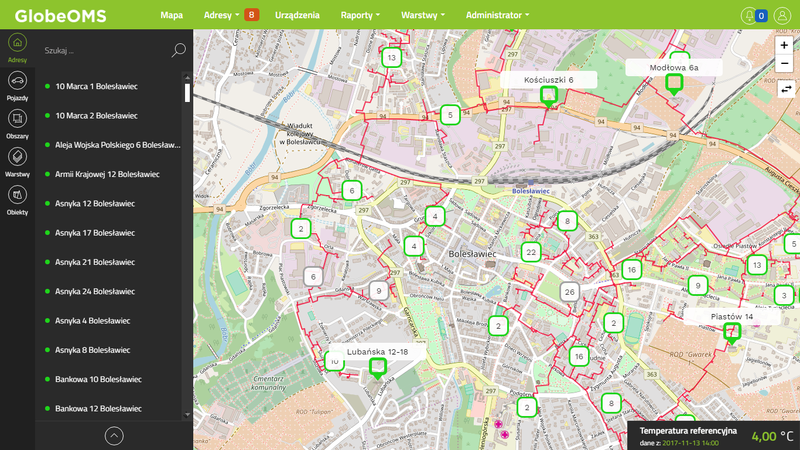 A project implemented by the Science and Technology Park of Euro-Centrum Sp. z o.o. in connection with the project entitled “Kapitał dla innowacji w obszarze poszanowania energii” (Innovation Capital for Energy Conservation), which is co-financed by the European Union under the European Regional Development Fund for the Innovative Economy Operational Program, Priority 3: Capital for Innovation, Measure 3.1: Initiating of Innovative Activity. Globe of Things Sp. z o.o.